Terry Gilliam has made his share of memorable films, such as Brazil and 12 Monkeys, but it may always be the film he struggled longest to make that will define his career. The 30-year battle to complete The Man Who Killed Don Quixote is the stuff of Hollywood nightmares. Some productions overcome horrendous shoots to become classics, like Francis Ford Coppola's Apocalypse Now, but no matter what the mythology sticks to them tight. Gilliam suffered through so much early on, including wholly unnatural natural disasters, that it was documented in the painful documentary Lost in La Mancha. Even within the last year, after Gilliam had secured financing and completed the film he faced months of legal battles that nearly squashed any hope of release. Well, I con confirm one thing now. The Man Who Killed Don Quixote is real. It had a one night only theatrical release here in the United States, which is sorta like one final slap in the face to Gilliam and his loyal fans. I have seen it, and by now many critics have and probably a few curious moviegoers. It exists. Whether the wait was worth it is another story. Like so much of Gilliam's work it is maddeningly convoluted and unfunny, too often resembling a bad Monty Python sketch they decided to leave on the cutting room floor. Other times Gilliam's garish mix of fantasy and realism create something wonderfully fun, insightful, and imaginative. Clearly, Gilliam enjoyed finally getting this movie made and there is a thrill at the sheer creation of it, right for a movie that celebrates creativity while also warning against the dangers of losing it. This is far from a traditional interpretation of Miguel de Cervantes’ 17th-century novel, although its quixotic themes are realized in the protagonist, Toby, played by Adam Driver. Toby is a big shot director whose "visionary" skills are being wasted shooting TV commercials. Whatever inspiration he once had is gone, widdled away by Yes Men who tell him whatever he needs to hear and what will be easiest. 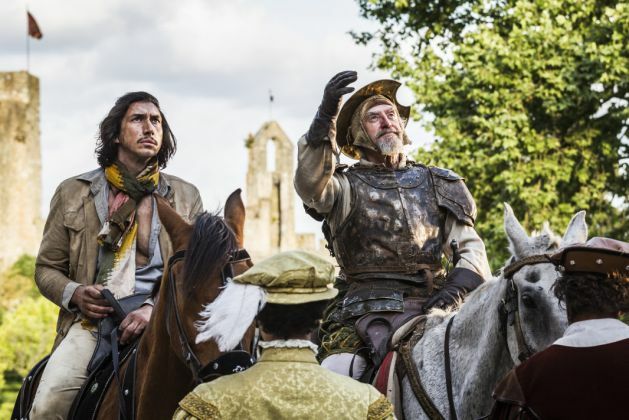 While in Spain for his latest ad shoot, Toby discovers the adaptation of Don Quixote he shot there as a college student. Curious how the actors from that film have turned out, he returns to the town only to discover the destructive impact he has had on their lives. The lead actress, Angelica, left home to become a big star but failed and now her life is in ruins. 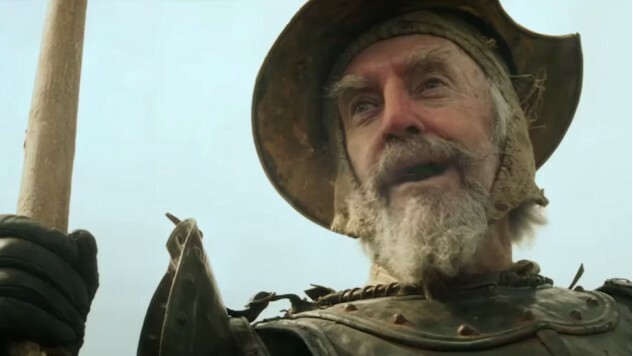 The actor who played Don Quixote, a simple shoemaker named Javier (Jonathan Pryce), was driven mad by the experience and now truly believes he is Don Quixote. He even rocks the suit of armor full-time, believes Toby to be his Sancho Panza, and is convinced windmills are dragons. It's not difficult to see why Gilliam has been so attracted to this story, undoubtedly seeing a lot of himself in Toby's straining against the corporate Hollywood machine and need for something more. He is just as much Javier, whose quixotic quest is fueled by a need to remain relevant. Doubtful this is the same movie he would've made if the first attempt had been a success, but it's the one we have now. And it works while Gilliam has his characters, with Toby forced by contrivance to accept the role of Sancho Panza, sliding deeper into a fantasy world of their own making. But as reality goes further out of grasp, so too does Gilliam's personal connection. This exploration of an artist's descent into delirium is too thin, ultimately covering familiar ground nobody needed to wait this many years to be reminded of. It's impossible for The Man Who Killed Don Quixote to escape from the shadow of its three-decade-long production, and with that kind of wait it was unlikely to ever live up to the myth that has been built around it. Maybe it's enough to just be happy that Gilliam is happy with it, and now he can go on tilting at brand new windmills.